In Part 1, I showed how a quick hex map could be used to generate reasonably historical borders for kingdoms and counties. I'm now going to show you how to turn those counties into baronies. Since this is Feudalism for People in a Hurry, I've simplified, edited, and ignored contentious or inconvenient issues wherever possible. Rather than try and design a system for one specific time period, in one specific area, I've built a system that's equally wrong for all historical variations, from Cambodia to Chablais. Side Note: the whole point of this design series is to approach posts like this from the opposite direction. Rather than starting with air currents, erosion, and forests and then building population centres that make sense given the terrain, I'm trying to build a system that does the feudal politics first, and then uses the politics to determine the terrain. Draw the approximate borders of the county and then zoom in. 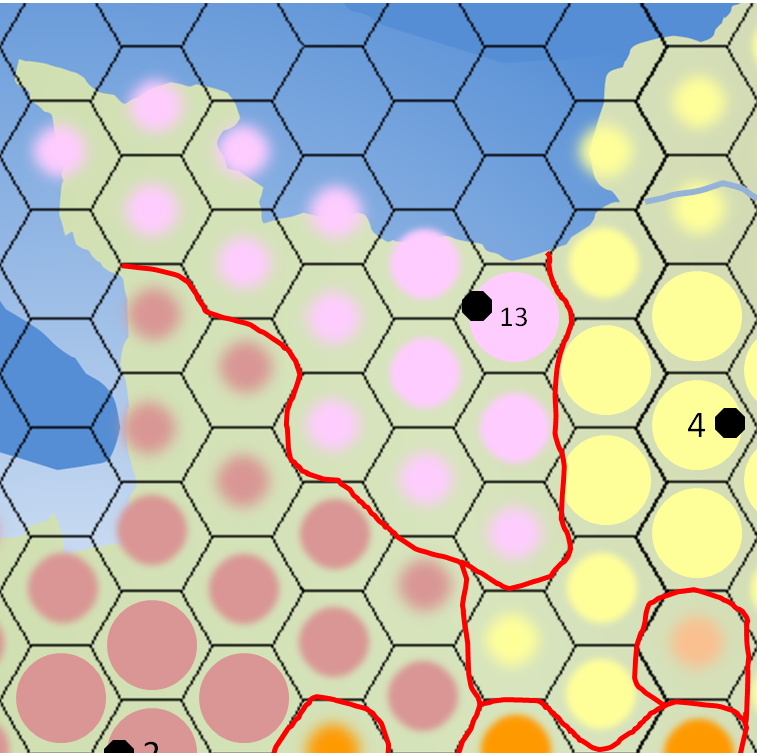 The previous maps used 18-mile hexes, but we need to zoom in to the standard 6-mile hexes. If you prefer another scale, zoom in accordingly. Your county should include some "Core Regions" (the full circles), some "Developed Regions" (large circles), and some "Undeveloped Regions" (smaller circles). 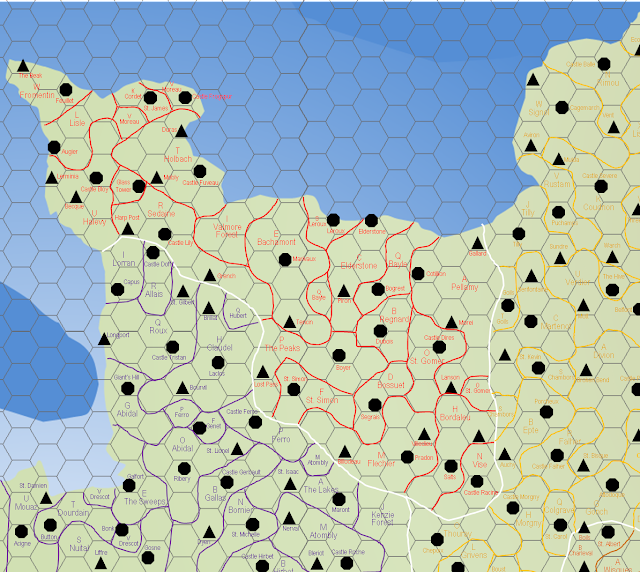 It might also contain impassible hexes (wastelands, mountains, etc.). I haven't included any in this example. Start with any your Core Regions. Pick the central hex of your central Core Region and assign it a letter. I'd suggest starting with A. Mark all adjacent hexes with this same letter. I'm using colours as well to make things more clear. This barony should contain the major city or town of your county. Roll 1d8. 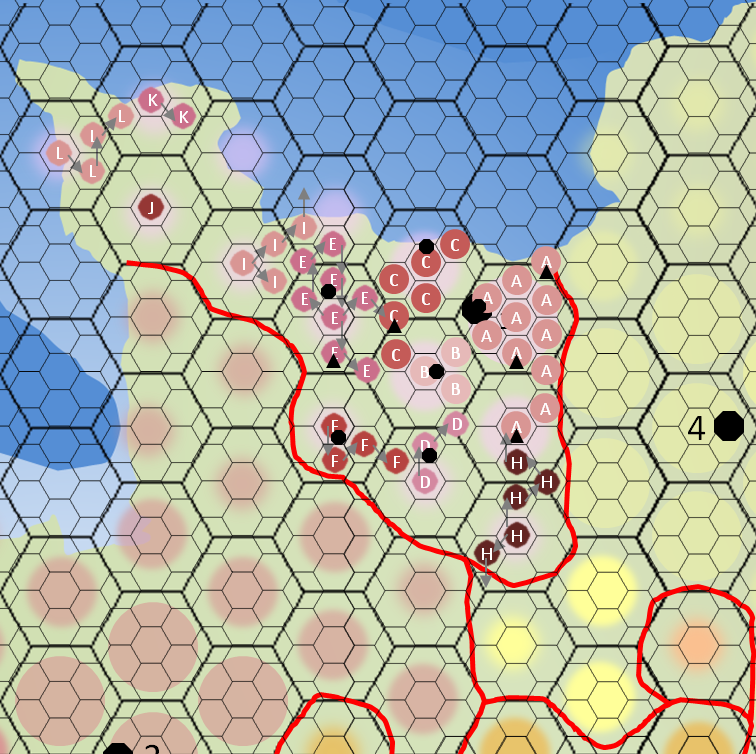 This is the number of "extra" hexes the Prime Barony can occupy. Using the same system as Step 4 from the previous post, add on extra hexes until you've used up all your "extra" hexes. Every other Barony occupies 1d8 6-mile hexes. If you want larger Baronies, use 1d10, 1d8+2, or whatever you think is appropriate. 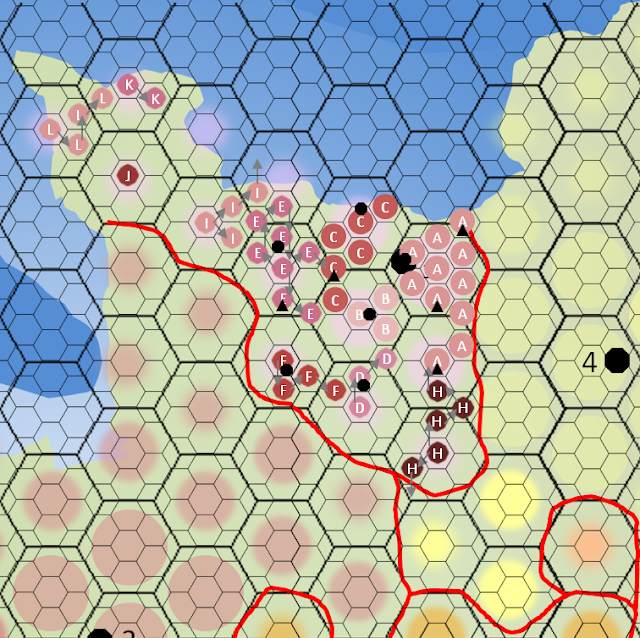 Towns should be placed at least 1 hex away from other towns or cities. Starting with the central hexes of any other Core Regions, assign a letter, and then move migrate to adjacent hexes until you have assigned all hexes for that barony. If you are stuck in a corner and can't assign any additional congruent hexes, mark the nearest empty hex. Then, move outwards to the Developed Regions, and then to the the Undeveloped Regions. Remember to assign black octagons and triangles as you progress. If the central hex of a region is inaccessible (because it's in water/mountains/a neighboring county/etc. ), don't worry about it, and skip that region. There should be some empty space left. Starting with the Core Regions, assign baronies of 1d8 congruent hexes. If you are stuck in a corner and can't assign any additional congruent hexes, mark the nearest empty hex. You don't need to follow the directional assignment / "random walk" rules at this stage. In fact, you don't need to stick with the "1d8 congruent hexes" thing at all. Just fill in the gaps. If you've run out of letters, switch to numerals or greek letters. Any baronies far from the Prime Barony are likely to be rebellious or completely independent. Draw some wiggly borders and get rid of unneeded letters. The Prime Barony (A) will usually belong directly to the Count or Duke. It may share the same name as the county, or it might have a different name entirely. The Count or Duke will also have at 1d4 other baronies as part of their personal territory. Assign them randomly. You may want to set 1 small barony, preferably in an Undeveloped Region, as a Royal Forest instead of a barony. This doesn't mean it's covered in trees, but it does mean the Monarch has kept it as a special, completely wild preserve for hunting deer, boar, goblins, etc. Remove any settlements. 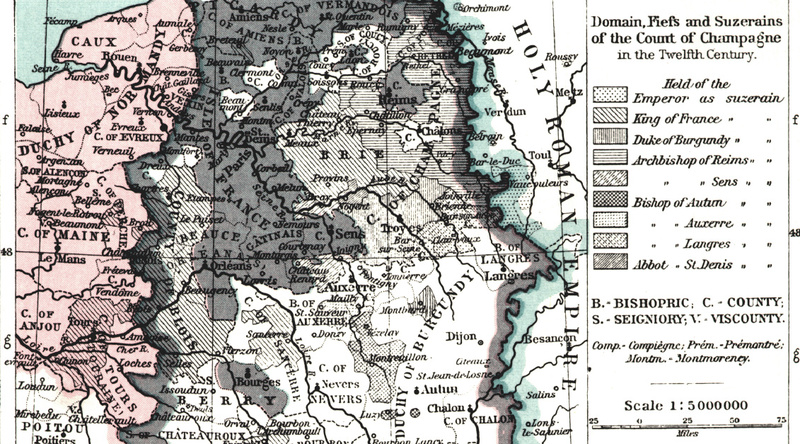 1 or more small baronies might be owned by archbishops. 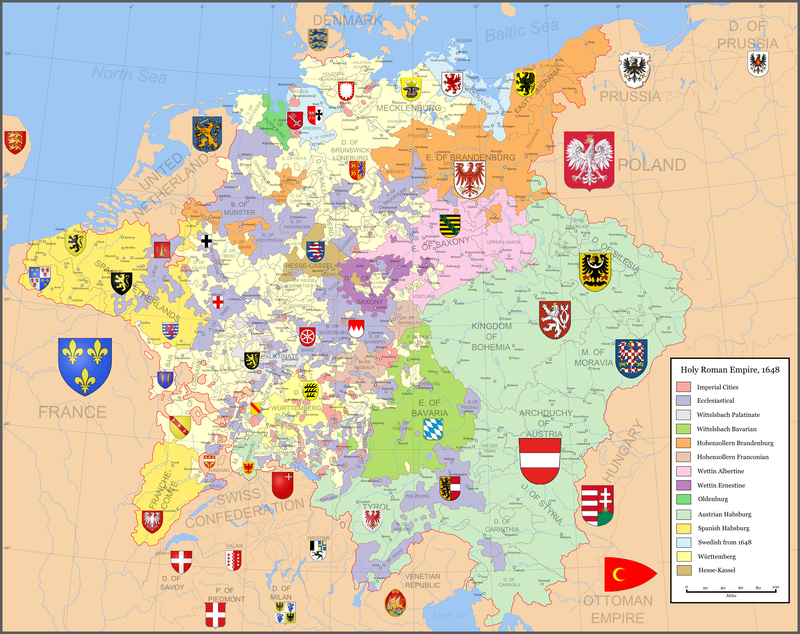 The church's lands are mostly within individual baronies, rather than being concentrated into a central seat of power, but from time to time an archbishop acts as both a secular lord and a religious leader. All other baronies will have individual Barons. If you really want to complicate things, some baronies might owe fealty to another Count or Duke, or directly to the Monarch. In a fantasy setting, you may also want to set aside land for elves, goblin clans, etc. Each barony has an name. You can use lists like this one, or this one, or any number of online generators to invent plausible names. Town names work fine, as do last names. You can probably name baronies, towns, and cities on an as-needed basis. 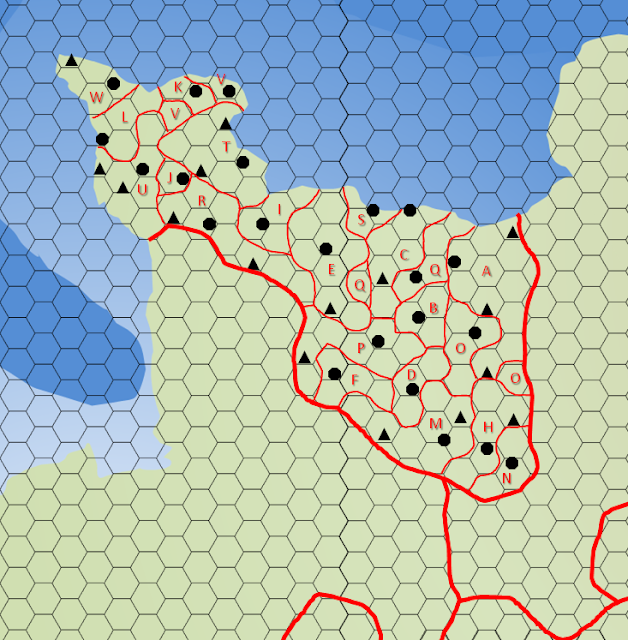 I've gone a little overboard with my map as a demonstration. Feel free to repeat town names. It happens all the time in real life. 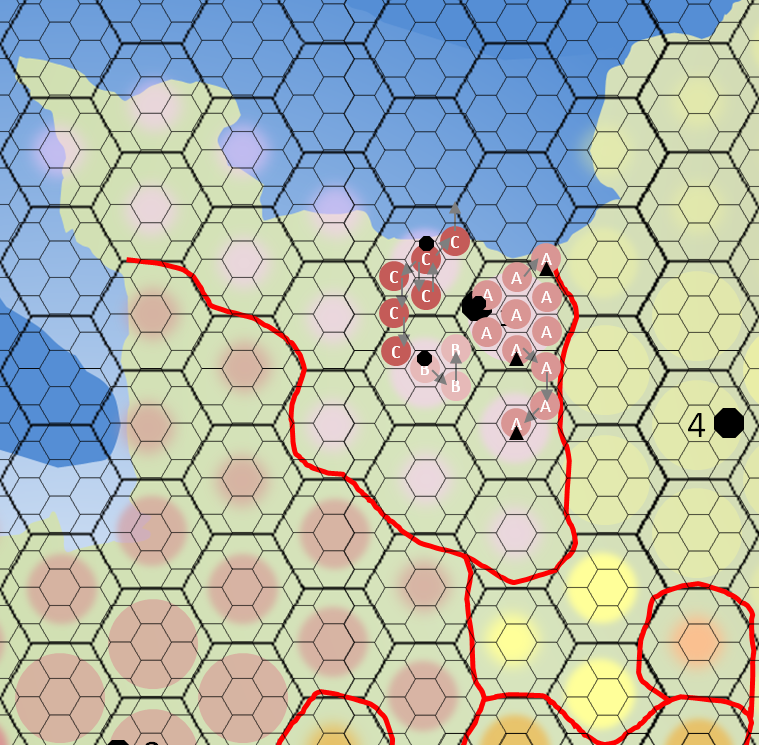 Barony J is an Elf enclave, and can more or less be ignored going forward. Barony D is owned by the Church directly, and has an Archbishop rather than a Baron. Barony I is replaced with a royal forest. Any settlements inside are removed. You now have a map of your county. 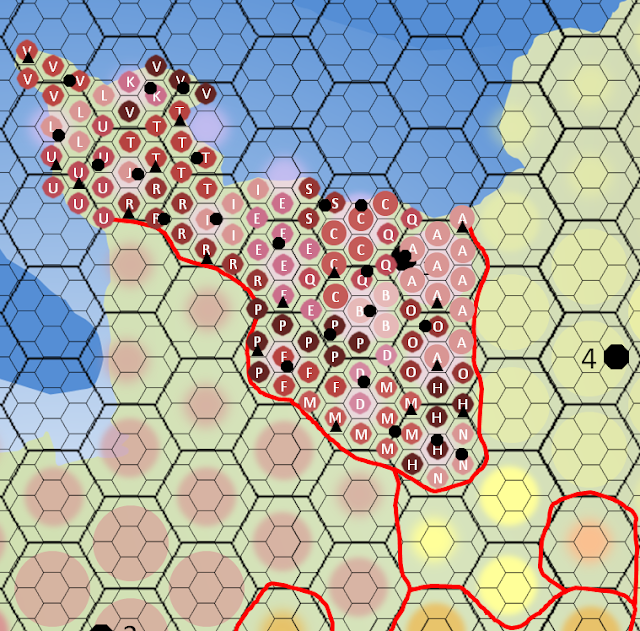 For the sake of convenience while hexcrawling, you might want to fill out any adjacent counties (or portions of them) using the same method. I went ridiculously overboard here. There's no need to do any of this for your games. By comparing the baronies to the "Core/Developed/Undeveloped" lands created in the previous part, we will be able to see which baronies are prosperous and which are sparsely populated. I will cover terrain, prosperity, and castle assignment in the next post. I will also cover how to avoid the whole "one-and-only-one interesting thing per hex" problem. French names were taken from a list of French authors. English and Scottish names were taken from existing lists of baronies. This is an amazing series! Whenever I get enough free time and place names, I'll try this out. Forgive my ignorance, but what is the purpose of assigning baronies in a county? I understand from beaurocratic system perspective, but I mean to ask from a gameplay one. Is this to assign who would be able to tax the characters from taking stuff on their land? Also, I think using the prosperity of a region to determine how many towns/cities/castles are in it is really cool but I think it would only work for a "civilized" setting. I don't think it would work for something like a central Asian steppe or a points of light/post apocolyptic setting. There's nothing to forgive. This series hasn't been the clearest on the "why" front. At the end, there will be a megapost that discusses the methods and the main utility. It ties into my "Feudalism in a Hurry" posts about taxation. Players pay taxes to their lord (usually a baron) in order to enter domain-level play at Level 1. This mapping system lets them find out who they work for, what areas are "safe" to explore (on their baron's land), what areas are dangerous (on an allied baron's land), and what are fun (rival baron's land). It generates terrain at the same time too! Also, yes, it wouldn't work at all for post-apocalyptic games, the steppe, space, or the modern era (although you could use it to generate districts for a police procedural, come to think of it). It's got a relatively narrow use. Part of what I'm trying to do is show that D&D hexcrawling is, despite the swords and the armor, kind of un-medieval, and that a hexcrawl in a civilized medieval setting is not only fun but pretty easy to do. 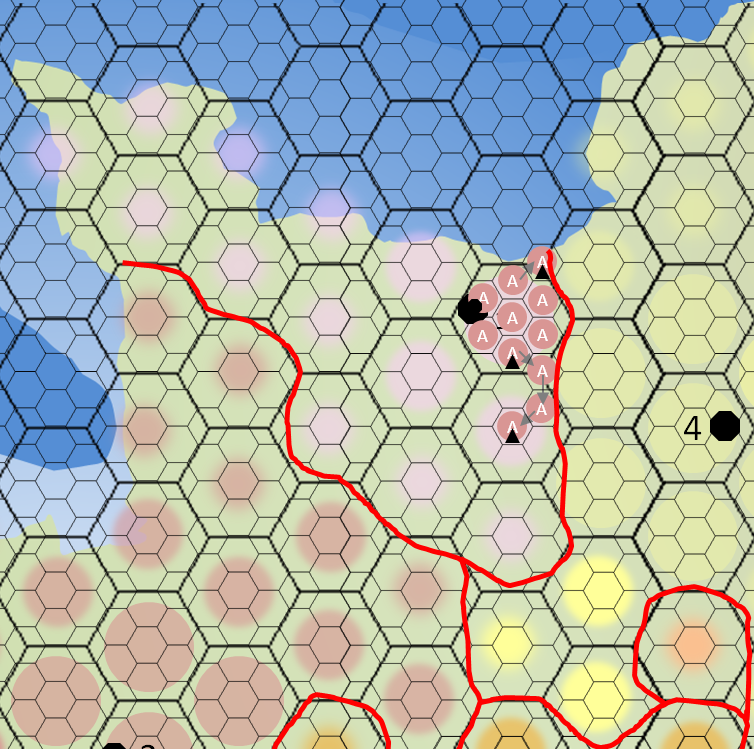 What lands/baronies/hexes does the first estate hold? Good point! Added a line explaining it to the "Assigning Ownership" section. Awesome. Thanks for the post. I'm setting up a campaign right now based on all your recent posts about feudalism. I imagined the campaign involving like three or four baronies, all of them vying for power. One or two could become allies, one or two could become enemies. But using this system, I'm going to have dozens of baronies. It seems like a lot for the players to remember and keep track of ("Who owns this land again? Have we dealt with him? Is that the guy who's horse you stole?") How do you run a campaign where this number of baronies doesn't get overwhelming? But I'm curious how you do it. How many baronies does an average PC of yours visit? Oh no! I deliberately went overboard when showing this off. Start waaaay smaller. 4-5 baronies is ideal. I tend to stress-test my systems by going for a much larger scale than most games need to ensure nothing breaks. So far, Group 1 (ToTSK) has visited just 2 Baronies (Elderstone and Bayle). Their dungeoneering experience has been very focused on 1 location. Group 1 has visited a few more. 6 total: Leroux, Elderstone, Bayle, Regnard, The Peaks, and St. Simon. They have only interacted politically with 2, however. Possibly 3 in the next game. Most of the time, they were just passing through. The baronies aren't fighting (openly), so there's no issue. 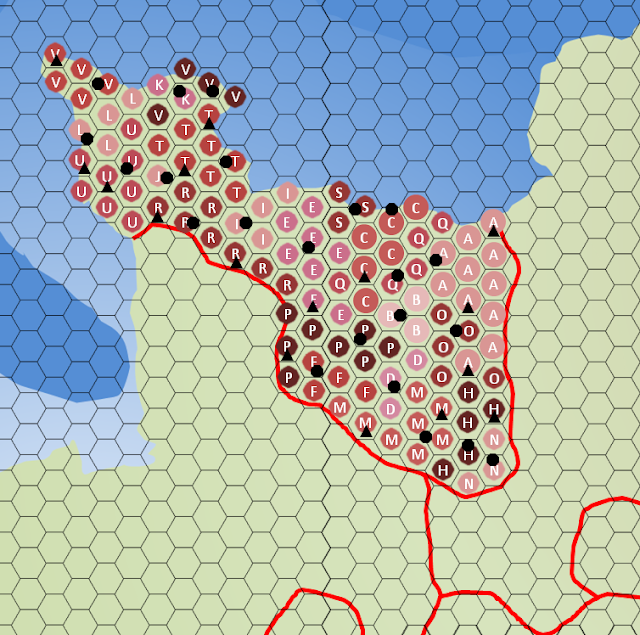 I filled one county with baronies, and the other counties are empty for now. Now that I've gotten used to it, and read some more history of the British Isles, a dozen baronies seems great. I think this is going to be a great sandbox for a campaign. One of my coastal baronies is owned by a Goblin king from a far-off land (kind of an England/Normany relationship). Honestly I can't imagine only having three or four baronies now! So many possibilities! Excellent. Don't forget to add some Baronies administered by the Church! By a scale of 4-5 baronies, do you mean that the campaign would deal with a smaller number of baronies, even though the counties has fifteen or so? I realize this sounds like a stupid question, but after reading the words "baronies," "counties," and "hexes" so many times, my brain's a bit fried. All I meant was that a campaign only needs 4-5 "fleshed out" baronies, with maps and titles and intrigues and so-on. The rest can be vaguely sketched or left unmapped until required.